This was a retrospective study carried out in the Departments of Otolaryngology and Neurosurgery, Post-graduate Institute of Medical Education and Research, Chandigarh, between December 2005 and July 2010. Twenty seven consecutive pediatric patients of CSF rhinorrhea were randomly divided into Group A: 13 patients who underwent endoscopic endonasal CSF repair using fibrin glue and Group B: 14 patients who had the procedure without fibrin glue. Computerized tomography (CT) cisternography to localize the site of the leak was performed pre-operatively. For endoscopic repair, one needs the bony anatomy and the site of defect precisely. Hence we preferred CT cysternography over magnetic resonance (MR) cysternography. All patients were operated by the same experienced surgeons [Figure 1]. Lumbar drain for a period of 3-5 days was put and oral acetazolamide post-operatively for a period of 8 weeks was given in five patients with raised CSF pressure (>180 mm of water). Under hypotensive anesthesia, utilizing 2.7 and 4 mm 0° and 30° rigid nasal endoscopes, the site of the leak was conﬁrmed intra-operatively using induced valsalva maneuver. The margins of the defect were deﬁned and the repair was carried out in four layers. Mashed muscle, fat and the fascia lata was harvested from the thigh giving a separate incision. The ﬁrst layer was mashed muscle plugging the defect the fat was also used as the first layer. The second layer was fascia lata, which was tucked in all around the defect. The third layer was vital layer, in which the middle turbinate ﬂap or septal mucosal flap was rotated. Fibrin glue was utilized in 13 patients. After graft positioning, fourth layer of surgicel and gelfoam were interposed between the graft and the nasal packing. The pack was removed on the 5 th post-operative day in all cases. Both groups were matched regarding the size of defect, the site of leak and the repair technique. Avoidance of coughing or straining was encouraged with bed rest and 30° head end elevation in all patients. All patients received intravenous third-generation cephalosporins for 5 days. The follow-up for successful patients ranged from 2 years 10 months to 6 years 3 months. The mean follow-up was 54.25 months. Data was systematically analyzed by a qualified statistician. Chi-square test was applied to analyze the significance of failure/success of the group using fibrin glue for endoscopic repair. This was carried out by referring to a Chi-square distribution table. Using the appropriate degrees of freedom the value closest to the calculated Chi-square was located. The closest P value was determined with the calculated Chi-square and degree of freedom. P > 0.05 is within the range of acceptable deviation hence not significant. Three patients had a history of prior attempted endoscopic endonasal repair. Two patients did not give any history of trauma or surgery. One of the patients had a history of meningitis. 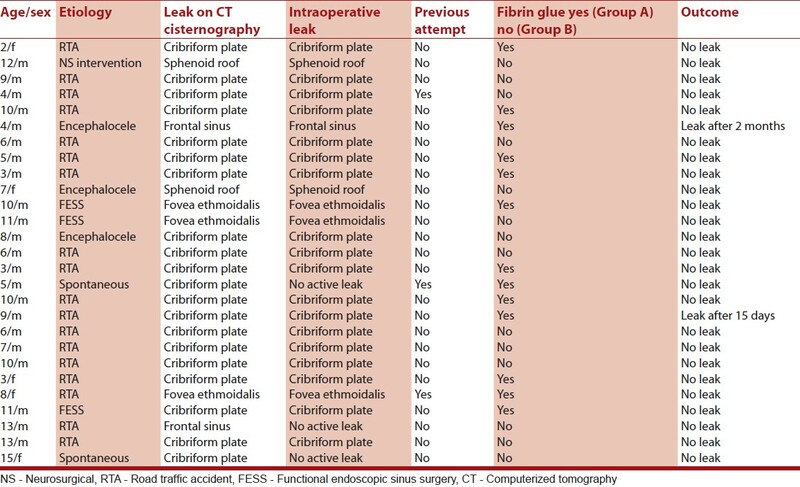 CT cisternography revealed leak from cribriform plate in most of the patients [Table 1]. MR cisternography was performed in two patients at other facilities. Three patients had coexistent meningocele or encephalocele [Figure 2]. All spontaneous CSF leaks were from the cribriform plate. Trauma was responsible for leak from everywhere except the sphenoid sinus. Of the 13 patients in Group A, there were 10 males and three females and the age range was 2-11 years with a mean age of 6.4 years. CSF leak was from the right side in nine patients and from the left side in four. Duration of the leak was 5-21 months. Trauma was the most common cause in 11/13 patients. Raised CSF pressure (>180 mm of water) was recorded in two patients. Cribriform plate was the most common site of leak. The size of defect ranged from 2 mm × 1 mm to 21 mm × 11 mm. Of the 14 patients in Group B, there were 12 males and two females and the age range was 4-15 years with a mean age of 9.07 years. Right side leak was present in nine patients and left side in five. The duration of the leak was 6-20 months. Raised CSF pressure was recorded in one patient. Cribriform plate was the most common site of leak. Defect size ranged from 2 mm × 1.5 mm to 20 mm × 11 mm. Transient anosmia was seen in two patients, which recovered within a month. Three cases had synechiae formation requiring release. Follow-up showed no recurrence in 25 (92.5%) patients. One of patients with high CSF pressure had recurrence 15 days after surgery and one patient with meningocele had recurrence after 2 months. Both patients belonged to Group A. One patient required revision surgery following, which he had no recurrence after 12-14 months of follow-up. The closure rate in this series was 92% in first attempt and 100% in the next attempt with fibrin glue and a success rate of 100% in first attempt without fibrin glue. There was excellent correlation between the radiologic ﬁndings and the surgical findings (r = 1). There was no statistically significant difference in endoscopic CSF repairs with or without fibrin glue (P = 0.48). CSF leak originating from the anterior fossa and sphenoid bone carries significant morbidity when inadequately treated and the serious complications include meningitis, subdural empyema and brain abscess. In spontaneous CSF leak and meningo-or encephalocele, the failure rate can vary between 25% and 87%. Autologous materials such as abdominal fat, nasal septum mucosa, bone, fascia lata and muscle can be used for repair ,,. The graft can be attached with fibrin glue, hemostatic sponges or vaseline gauzes. Adequate resection of the mucosa around the bone defect is a must for secure graft attachment. , The graft can be positioned in an inlay form or in an onlay form. In our series, we performed the inlay technique in all patients. In our series closure rate was 92% in first attempt and 100% in the next attempt with fibrin glue and a success rate of 100% in first attempt without fibrin glue. Various studies reported a success rate of 97% with fibrin glue and 92-100% without glue. ,,, Rodney et al. insisted if tissue adhesives are used, they must be applied conservatively because a thick layer of adhesive may prevent the graft material from coming in contact with the wound bed. Jankowitz et al. reported that there was no statistical difference in persistent CSF leak between those cases, in which fibrin glue was used at the time of surgery and in those in whom fibrin glue was not used. Our results were comparable with the earlier reports with better results without fibrin glue. From our experience of failures, it has emerged that meticulous technique with accurate preparation of margins and graft coverage of at least 5 mm from the margins was the most important factor. This is the first study, which compared endoscopic CSF repairs with and without the use of fibrin glue in children. There was excellent correlation between the radiologic ﬁndings and the surgical ﬁndings (r = 1). We found that there was no statistically significant difference in endoscopic CSF repairs with or without fibrin glue (P = 0.48). CSF repair without fibrin glue appears more cost saving. Admittedly this series is small; thus it is difficult to reach a definitive conclusion, nonthetheless experience presented herein may serve as the basis of observation and further studies. 1. Hao SP. Transnasal endoscopic repair of cerebrospinal fluid rhinorrhea: An interposition technique. Laryngoscope 1996;106:501-3. 2. Wigand ME. Transnasal ethmoidectomy under endoscopical control. Rhinology 1981;19:7-15. 3. McCormack B, Cooper PR, Persky M, Rothstein S. Extracranial repair of cerebrospinal fluid fistulas: Technique and results in 37 patients. Neurosurgery 1990;27:412-7. 4. Bibas AG, Skia B, Hickey SA. Transnasal endoscopic repair of cerebrospinal fluid rhinorrhoea. Br J Neurosurg 2000;14:49-52. 5. 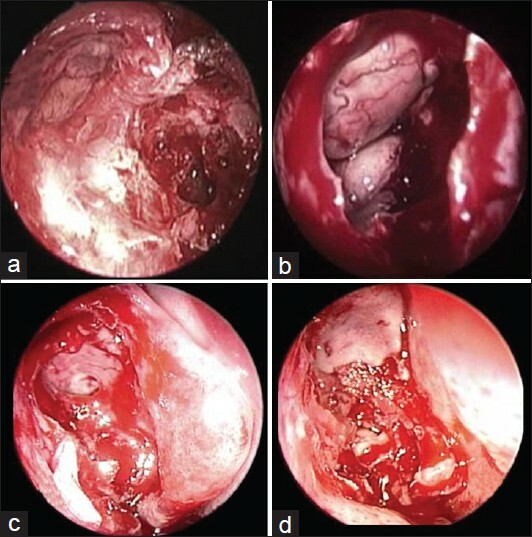 Zeitouni AG, Frenkiel S, Mohr G. Endoscopic repair of anterior skull base cerebrospinal fluid fistulas: An emphasis on postoperative nasal function maximization. J Otolaryngol 1994;23:225-7. 6. Shaffrey CI, Spotnitz WD, Shaffrey ME, Jane JA. Neurosurgical applications of fibrin glue: Augmentation of dural closure in 134 patients. Neurosurgery 1990;26:207-10. 7. Hegazy HM, Carrau RL, Snyderman CH, Kassam A, Zweig J. Transnasal endoscopic repair of cerebrospinal fluid rhinorrhea: A meta-analysis. Laryngoscope 2000;110:1166-72. 8. Erkan AN, Cakmak O, Kocer NE, Yilmaz I. Effects of fibrin glue on nasal septal tissues. Laryngoscope 2007;117:491-6. 9. Nishihira S, McCaffrey TV. The use of fibrin glue for the repair of experimental CSF rhinorrhea. Laryngoscope 1988;98:625-7. 10. Gupta AK, Gupta AK, Verma M. Cranionasal fistula in pediatric population: Is endonasal endoscopic approach effective? Int J Pediatr Otorhinolaryngol 2007;71:1537-41. 11. Daele JJ, Goffart Y, Machiels S. Traumatic, iatrogenic, and spontaneous cerebrospinal fluid (CSF) leak: Endoscopic repair. B-ENT 2011;7 Suppl 17:47-60. 12. Wormald PJ, McDonogh M. 'Bath-plug' technique for the endoscopic management of cerebrospinal fluid leaks. J Laryngol Otol 1997;111:1042-6. 13. Schmerber S, Righini C, Lavielle JP, Passagia JG, Reyt E. Endonasal endoscopic closure of cerebrospinal fluid rhinorrhea. Skull Base 2001;11:47-58. 14. Marks SC. Middle turbinate graft for repair of cerebral spinal fluid leaks. Am J Rhinol 1998;12:417-9. 15. de Almeida JR, Ghotme K, Leong I, Drake J, James AL, Witterick IJ. A new porcine skull base model: Fibrin glue improves strength of cerebrospinal fluid leak repairs. Otolaryngol Head Neck Surg 2009;141:184-9. 16. Cui S, Han D, Zhou B, Zhang L, Li Y, Ge W, et al. Endoscopic endonasal surgery for recurrent cerebrospinal fluid rhinorrhea. Acta Otolaryngol 2010;130:1169-74. 17. McMains KC, Gross CW, Kountakis SE. Endoscopic management of cerebrospinal fluid rhinorrhea. Laryngoscope 2004;114:1833-7. 18. Mirza S, Thaper A, McClelland L, Jones NS. Sinonasal cerebrospinal fluid leaks: Management of 97 patients over 10 years. Laryngoscope 2005;115:1774-7. 19. Kirtane MV, Gautham K, Upadhyaya SR. Endoscopic CSF rhinorrhea closure: Our experience in 267 cases. Otolaryngol Head Neck Surg 2005;132:208-12. 20. Rodney J, Wilensky, Eileen Maloney, Grady M. Sean, Bolger, William E. Elevated Intracranial Pressures in Spontaneous Cerebrospinal Fluid Leaks. American Journal of Rhinology 2003;17 (4):191-195. 21. Jankowitz BT, Atteberry DS, Gerszten PC, Karausky P, Cheng BC, Faught R, et al. Effect of fibrin glue on the prevention of persistent cerebral spinal fluid leakage after incidental durotomy during lumbar spinal surgery. Eur Spine J 2009;18:1169-74. Mohindra, S., Mohindra, S., Gupta, K.